« Talk: Surveying Trees for Bats: Can we do better? It’s back! Our annual event, Big Bat Night at the Knapp and Papermill reserve will be returning in 2019. This event is open to the public, so please feel free to come along and bring any friends, family or passers-by who want to see and hear bats in their natural habitat. 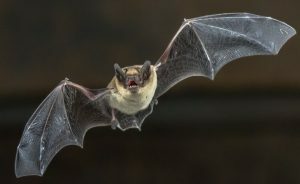 We usually hear at least 4 – 5 species of bat, including the large bats who are feasting on the emerging maybugs/ cockchafers at this time of year. The walk is not too taxing and sunset isn’t too late, so this is an ideal introduction to bats for children who may be interested in finding out more about nature. The walk typically lasts an hour or two, although some members get hooked and stay later in search of more elusive species.